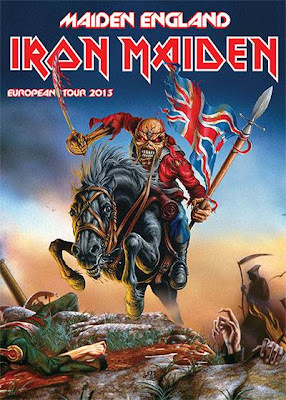 Iron Maiden have announced more dates for their 2013 Maiden England European Tour. The metal legends will play The Netherlands on June 25th at the new 17,000 capacity Ziggo Dome in Amsterdam. Tickets go on sale Saturday, October 27 at 10am CET with an exclusive first ticket pre-sale for Iron Maiden Fan Club members on Friday, October 26 from 9am CET - 5pm CET. Following the announcement of the Friends Arena show in Stockholm, a 50,000 capacity stadium which sold-out in record time, Maiden will now play another Swedish date, Malmo Stadium on July 10th. Tickets go on sale Friday, October 26 at 9am CET with an exclusive first ticket pre-sale for Iron Maiden Fan Club members on Wednesday, October 24 from 9am CET - 6pm CET. Iron Maiden Fan Club members will also be eligible to be in the draw to be First To The Barrier at both these shows. Due to phenomenal demand for tickets, Iron Maiden have also added a second show at the 14.000 capacity Frankfurt Festhalle on June 12th. Tickets for the show on June 12, 2013 are available now. Stay up to date on Maiden tour dates here.